Belize NMS: Broad area of low pressure over the western Caribbean Sea is influencing the weather. 24-hour forecast: Mostly cloudy today and tonight. 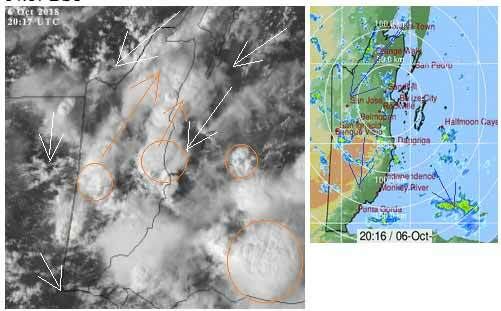 Several outbreaks of showers and thunderstorms, along with periods of rain will affect most areas of the country. General Outlook: For Sunday and Sunday night, some showers and thunderstorms will continue to affect the country. Tonight N-NE 5-15 kts Choppy 3-5 ft SOME OUTBREAKS OF SHOWERS AND THUNDERSTORMS. Tomorrow N-NW 5-15 kts Light Chop 2-4 ft SOME OUTBREAKS OF SHOWERS AND THUNDERSTORMS. Tomorrow Night W-NW 5-15 kts Choppy 3-5 ft SOME SHOWERS AND A FEW THUNDERSTORMS. Outlook W-NW 5-15 kts Choppy 3-5 ft SOME SHOWERS AND A FEW THUNDERSTORMS MOSTLY NORTH. A large cyclonic gyre is over the NW Caribbean. Scattered moderate isolated strong convection is over the northern Caribbean from 18N-22N between 60W-78W. 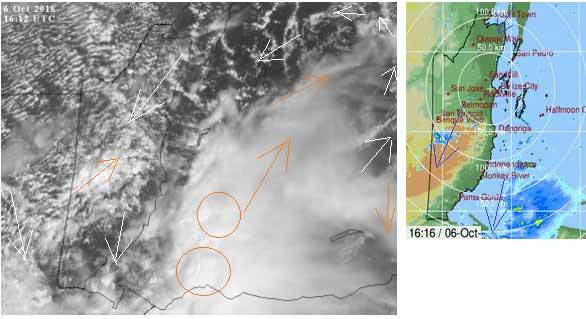 Expect active convection to persist across the central and western Caribbean during the slow drift of the cyclonic gyre into the southern Gulf of Mexico. Some heavy weather could be rolling into Belize this weekend and you need to be prepared - especially if you are in flood prone areas. The low pressure area is called Invest 91L, and right now it's sitting near Cabo Gracias a Dios or just north of eastern Honduras. Here's why you need to watch it closely. The National Met Service says the models show that it will move west-northwest towards Belize then turn northward on Sunday. Some models show the low center coming just offshore Belize by Sunday morning. The MET Office warns that the worst case scenario is that the system could become a minimum tropical storm when it is right on our doorsteps. But whatever happens, the biggest concern right now is the projected heavy rainfall - which is estimated at one to two inches per day over the next few days, with isolated amounts of four inches possible. 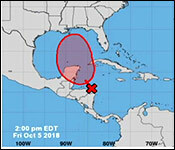 "We had gotten an advisory on Invest 91L that is somewhere between Honduras and Belize and it should make itself up north passing just north of Belize City, but we got to understand that it will be a rain maker, so our job this afternoon was to make sure that we give the proper advisory especially to those especially who lives in flood prone areas in the north and in Belize District." 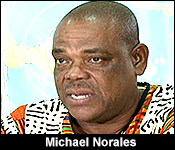 "What we have did was summons every district to convene a meeting. The reason for this meeting is to be proactive. So what we did, we asked them for a starts cape readiness for each EOC. A system can shift anytime. So we prefer the whole country to be prepared than to be sorry. Each district coordinator and each committee identifies their flood prone areas within their communities in the district and those are the villages or the low laying areas for example the city. CEMO knows exactly in Lake I or wherever. We look at people if necessary we would have to go and help them. In the districts it's the same thing." "And the actual projections for the rainfall?" 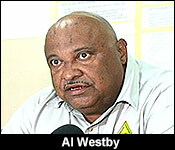 "It will be somewhere between 2-3 inches per day of rain over the weekend. At 3pm we got an advisory and they are telling us that it should happen over the weekend and then to Sunday when the rain should be falling constantly." "The areas of the city that are flood prone: Belama Phase 3 and 4, Krooman Laggoon area behind Lake Independence, Gungulung area and Jane Usher area and certain parts of Fabers Road extension and Antelope Street extension. We are not here to frighten anybody. We are just here to advise you. Just listen to the different advisories that we will be getting through the media. Be keen, be ready to move if your area becomes flooded. Just get ready. That's what we are asking." Shelters are not opened at this time - but if necessary they will be opened and you need to stay tuned to your radio and TV for local information. There are hotline numbers to call if you need emergency assistance. 936 is the NEMO toll free Hotline, and in the city, the CEMO number is 670-7942. Again, the MET office says quote, "The rainfall from this system will be the main hazard, and if it develops into a depression or storm, the wind also. We estimate that rainfall will be one to two inches per day over the next few days, with isolated amounts of four inches possible; therefore, the threat of flooding continues." The National Hurricane Center says that the Formation chance through 48 hours is medium at 50 percent likelihood. We are in a Central American Gyre that is the Caribbean air and cloud around us is rotating, it is not a storm, it is just slow rotating area of rain and heavy clouds. 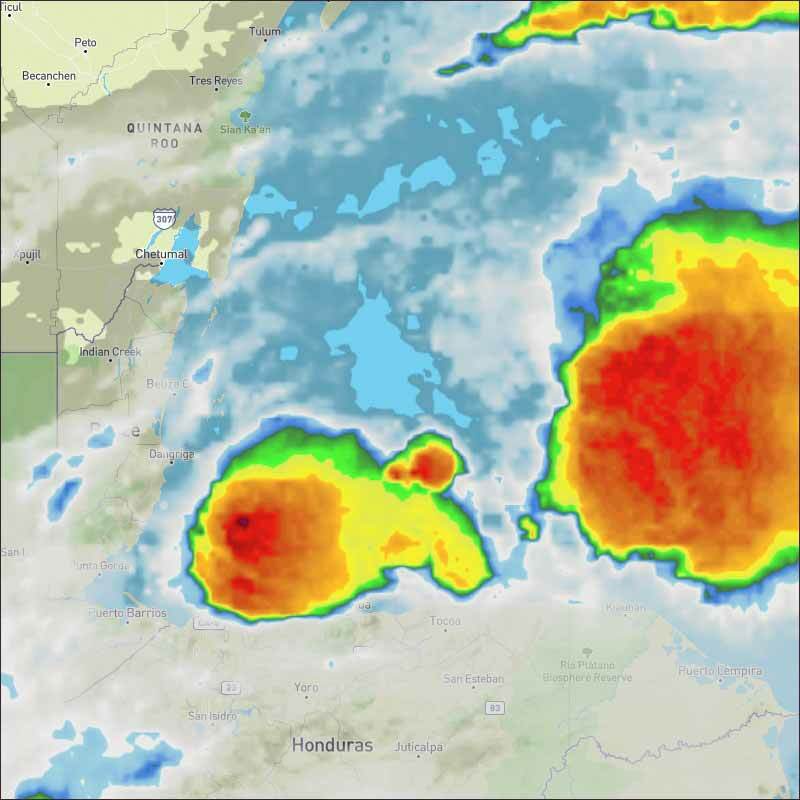 It is typical ITCZ activity sitting in one area, in this case the western Caribbean. This is not changing our weather, we are still getting numerous rain showers, although presently less than over the last few days. Looks like today will yet again me a mainly cloudy day, with the odd gimps of sunshine, but ever present chance of rain showers. The Cloud and rain picture. The cloud and air movements are rather complex. Yesterday there was some "Tiger" surface wind from the SW, although none here in Belmopan this morning, there appears to be low or surface clouds moving from the SW off Honduras coast and up into the Caribbean, but they are turning northwards and out in the sea well away from Corozal, they are turning westwards and being reinforced by an unusually strong NNE Caribbean winds and chunky clouds. In other words, there is a low level air rotation, some 150 miles to the east of Chetumal, with a typical ITCZ swellup, but only causing a small area of moderate rain. The high level clouds over Belize and just off the shore are from the SW as typical. This looks a bit as if the beginnings, or start up of a Tropical storm. 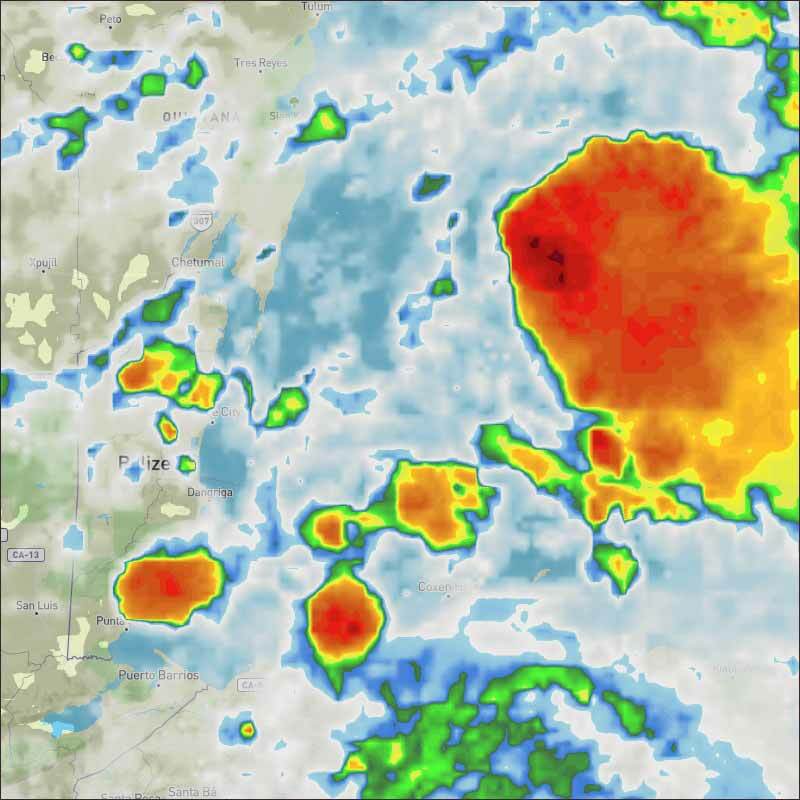 Belize is unlikely to see any storm or even a Tropical Depression, but this is all being caused by a low pressure area, which is typical with a Central American Gyre There are other swellups just out at sea from Toledo with rain out at sea. The Cloud and rain picture this afternoon. And so the rain showers continue, as they have been for several days.